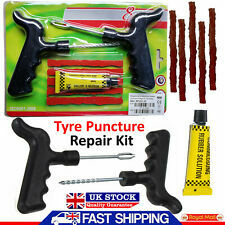 Car Van & Motorbike Tubeless Tire Tyre Puncture Repair Kit. Remove the object that caused your puncture, Then Slide the rasp into the hole to roughen and clean the edges, Insert a strip of tyre repair glue into the needle then place in hole to seal, do not use. 50pcs Car Bike Tyre Plug Tire Tubeless Seal Strip Puncture Repair Recovery Tool. Can be used for all kinds of tubeless tires, no need for glue. Note: The real color of the item may be slightly different from the pictures shown on website caused by many factors such as brightness of your monitor and light brightness. 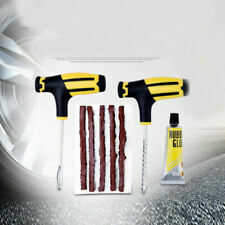 Easy Carring Car Tubeless Tyre Puncture Repair Kit Tool Tire Plug 8 In 1 Set. • Trim excess plug stickingout and let dry. Inflate tire and test for leak. • Remove object that causedthe puncture. Insert the rasp tool into hole and slide up and down to roughenand clean the inside of the hole. Suitable for all Types of Tubeless Tyre. Motorbike / ATV / Multi-Use. Allows the tyre to be repaired without removing the tyre from the wheel. 1 T Handle strip insertion tool. 1 Allen key wrench. Allows the tyre to be repaired without removing the tyre from the wheel. Tubeless Tyre Repair Kit. Ideal for repairing punctures an tubeless. EASY TO FOLLOW INSTRUCTION LEAFLET. For a permanent repair, use the REMA TIP TOP patches corresponding to the valid repair chart. Accelerator solution for the application of REMA TIP TOP RAD, PN and UP repair patches. MINICOMBI, REMA STEM, SV bonding rubber. TUBELESS TYRE REPAIR PUNCTURE KIT TOOL PLUG 6PC SET-CAR BIKE QUAD MOTOR BIKE VAN. NEW Dynaplug® cARBON Ultralite Tubeless Tyre Repair Kit specially for motorcycles, scooters, quad bikes and ATVs. 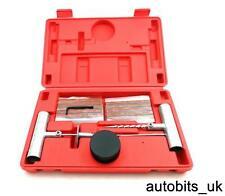 Kit contains: 1 x Dynaplug® Ultralite tool, 2 x tyre repair plugs, 1 x insertion tube, 1 x Tube Cleaner. 30 x 4" Tyre Repair Strings. Long Life Span & Convenient to use. Material: Plastic. Car Bike Bicycle Motorcycle Tubeless Tire Tyre Puncture Plug Repair Kit Tool New. 1 x Needle tool for tyre rubber strip insertion. Remove object that caused the puncture. Insert the rasp tool into hole and slid up and down to roughen and clean the inside of the hole. TUBELESS MOTORCYCLE SCOOTER ATV TYRE REPAIR KIT. Moto accessories have beeruggedly tested and prepared with the rider and biker imind. They are all made using the best quality materials and sourced from factories that adhere to the Viper Moto ethos of good products at good prices. Long Life Span & Convenient to use. Easy to Install. Colour: Black. PERFECT FOR CARS, VANS, LORRIES, MOTORCYCLES, RIDE-ON MOWERS, THE LIST GOES ON. WE HAVE BEEN USING THESE FOR QUITE A WHILE NOW WITH VERY GOOD RESULTS, ONE TYRE HAS BEEN ON THE VAN 2 YRS PLUS NOW, WITHOUT ANY PROBLEMS. 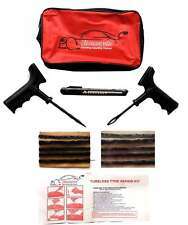 Tire repair kits - tire pluggerFlats Happen! Regardless of thickness or pre-sealant additives they're all vulnerable to being punctured. The Gun is a spring loaded device that 'drives' the plug into the hole. 6 - 7MM WIDE STRINGS. Easy to Install. Colour: Black. 1 Stable PVC storage box in green. TUBELESS MOTORCYCLE CAR SCOOTER ATV TYRE REPAIR KIT. Moto accessories have beeruggedly tested and prepared with the rider and biker imind. They are all made using the best quality materials and sourced from factories that adhere to the Viper Moto ethos of good products at good prices. High quality with strong strength and maximum endurance. Not easy to deform. Set x 11pcs Heavy Duty Tire Repair Kit Car Motorcycle Tyre Repair Kit. The Heavy Duty 11 Piece Tire Repair Kit is made with the best materials available. 100 PCSHEAVY DUTY 6 - 7MM WIDE STRINGS. Easy to Install. Colour: Black. 1 x Needle tool for tyre rubber strip insertion. Excellent tool to keep in your car with the spare wheel. 1 x Rasper tool for hole widening and cleaning. NEW MODEL FOR 2019. TUBELESS MOTORCYCLE CAR SCOOTER ATV TYRE REPAIR KIT. Suitable for all Types of Tubeless Tyres. Moto accessories have been ruggedly tested and prepared with the rider and biker in mind. It is a puncture repair kit for tubeless tyre. It is essential for vehicles with tubeless tyres. Remove the object that caused tyre puncture. 3 x Tyre repair strip. This kit will let you repair the puncture quickly and effectively. 50 X HEAVY DUTY TUBELESS TYRE REPAIR KIT INSERTS PLUGS STRINGS 8"
50 PCS HEAVY DUTY 6 - 7MM WIDE STRINGS. Easy to Install. Colour: Black. Allows the tyre to be repaired without removing the tyre from the wheel. We provide a range of genuine and universal products. Our aim is to provide the accessories you need to personlise your vehicle, protect your vehicles interior and make driving easier. 100 x 4" Tyre Repair Strings. Long Life Span & Convenient to use. Colour: Black. Material: Plastic. 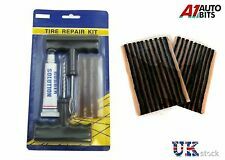 Tubeless Tire Tyre Puncture Repair Kit Car Van Motorcycle Bike Tool 33 Strings. Car Bike Bicycle Motorcycle Tubeless Tire Tyre Puncture Plug Repair Kit Tool New. 1 x Needle tool for tyre rubber strip insertion. The Dynaplug Ultralite is designed for all tubeless tyre applications but especially suited for two-wheeled vehicles. Machined from billet aircraft 6061 aluminum, it’s robust but still ultra-light at only 2 ounces. Puncture Fix Car VAN Motorcycle Tubeless Tyre Repair Tool Kit 30 Strip. Allows the tyre to be repaired without removing the tyre from the wheel. 1x 35 pcs Tubeless Tyre Repair Kit. Sub-Type:Tyre Repair Kit. 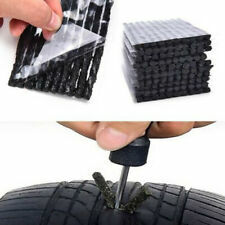 50pcs Car Bike Tyre Plug Tire Tubeless Seal Strip Puncture Repair Recovery Tool. Can be used for all kinds of tubeless tires, no need for glue. Made of high quality material, durable and practical to use. TUBELESS MOTORCYCLE CAR SCOOTER ATV TYRE REPAIR KIT. Moto accessories have been ruggedly tested and prepared with the rider and biker in mind. They are all made using the best quality materials and sourced from factories that adhere to the Viper Moto ethos of good products at good prices. 50 x 4" Tyre Repair Strings. Long Life Span & Convenient to use. Material: Plastic. 50pcs Car Bike Tyre Plug Tire Tubeless Seal Strip Puncture Repair Recovery Tool. Can be used for all kinds of tubeless tires, no need for glue. Quantity: 50pcs. Note: The real color of the item may be slightly different from the pictures shown on website caused by many factors such as brightness of your monitor and light brightness.